‘Muybridge: Maps, Myth & Me’ School pupils make artwork in response to 8th May 1904, Kingston, by Becky Beasley, March 2011. 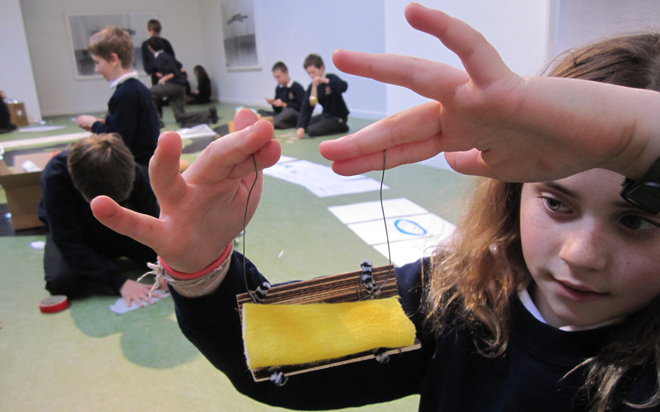 Throughout Muybridge in Kingston, the Stanley Picker Gallery collaborated with Kingston Museum to give local schools the exciting opportunity to interact, explore and create new artwork across and based upon Kingston-upon-Thames. Participants were introduced to the work of Eadweard Muybridge and considered the significant impact of this practice upon modern culture, investigated his photographic panoramas, his life, both in the American West and in Kingston, and the work of acclaimed contemporary artist Becky Beasley whose installation 8th May 1904, Kingston was inspired by the mystery surrounding Muybridge’s death. Children collaborated to invent and make their own dioramic panoramas of Kingston which were exhibited in celebration of their achievements.